Krohn-Dehli celebrates scoring on Saturday. 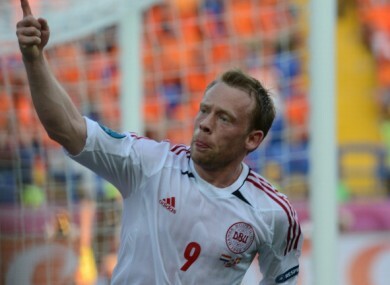 MICHAEL KROHN-DEHLI shapes as Denmark’s key man when they take on Portugal in Euro 2012′s Group B clash on Wednesday. The 29-year-old winger sent fans around the world scrambling to find out who he was when he scored Denmark’s goal in their shock victory over the Netherlands on Saturday. But Krohn-Dehli cannot expect to fly under the radar against Portugal. Head coach Paulo Bento and his Portugal team knew all about Krohn-Dehli before his goal against the Dutch, as the Brondby winger scored a crucial goal in qualifying against the Portuguese. In Group H of Euro 2012 qualifying, Denmark and Portugal met on the final match day knowing that the winner would qualify automatically for the continental championships. After 12 minutes in Copenhagen, Krohn-Dehli cut in from the left and curled his shot from the edge of the area past Portugal’s goalkeeper Rui Patricio and Denmark went on to win 2-1. Denmark head into Wednesday’s match with a good recent record against Portugal, with the two teams having been in the same qualifying group for both Euro 2012 and the 2010 World Cup. In the four qualifying matches over those two campaigns Denmark defeated Portugal twice and drew once. Denmark head coach Morten Olsen will hope that confidence and the knowledge that another victory will put them into the quarter-finals of Euro 2012 will inspire his side against Portugal. In the Portuguese camp, Bento will have to build his team’s goalscoring confidence before they face the Danes. Portugal have scored just one goal in their last four matches and after opening their Euro 2012 campaign with a 1-0 loss to Germany, Bento’s side must hit the back of the net against Denmark. Cristiano Ronaldo was barely sighted against Germany, particularly in the first half, while Pepe, Nani and Silvestre Varela had Portugal’s best chances to score. Portugal must get the ball to Ronaldo more often if they are to win on Wednesday. Danish striker Nicklas Bendtner will play his 50th match for his country if selected against Portugal and having scored four times in four games against the Portuguese, the 24-year-old will be another danger that Bento and his team will have to watch out for. Email “Preview: Krohn-Delhi out to upset Portugal”. Feedback on “Preview: Krohn-Delhi out to upset Portugal”.